It has been a very fun Christmas so far. The presents are good but the people are even better and we are so blessed to have so many people in our lives. Our Christmasing began on Tuesday when Grandpop brought some mighty fine carrot cake. 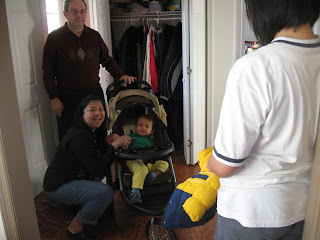 Then on Wednesday Grandpa and Mimi and Uncle Jonathan arrived along with cousin Ruby. Aaron decided that cousin Ruby was great. 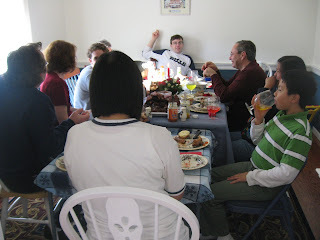 Then came Christmas morning and we had baked french toast with both grandparents this is so much fun. 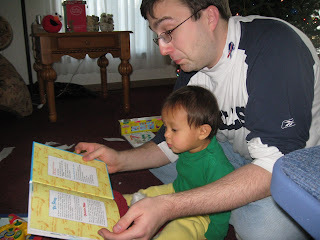 Aaron loves books and here Perry is reading to him. It warmed up so the grandpas took Aaron for a walk. He soon fell asleep and slept a good while. We of course ate way too much. In the last few years we have started a new tradition that involves ribs. So we consumed ribs and roast and generally ate too much. But we had fun eating and talking. We missed Aunt Cindi who wasn't feeling well as well as David, Kim and Anthony. 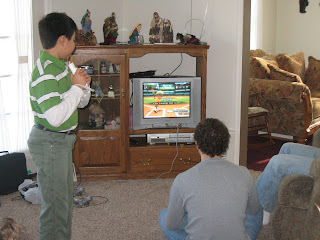 Jonathan brought his Wii up and so there was some serious competition going on. As well as some laughs as the grown-ups attempted to play. We also played some serious scrabble and introduced Jonathan to a strange game called In A Pickle. 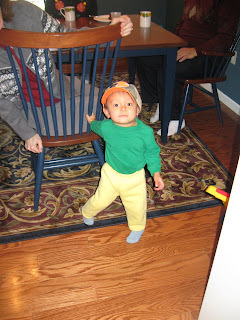 Yes his mother dressed him as an elf for Christmas. Someday he will say I can't believe you did this to me Mom. Grandpa and Uncle Jonathan kept Aaron as the women chased the after Christmas sales. Overall it has been a great Christmas so far. In all the chaos I am thankful that Jesus loves me and that He is the reason for the season. He makes everyday more meaningful.